Once your baby is past the crawling and walking stage, life can get pretty interesting with an active toddler on your hands. Most toddlers love to move, but did you know that as much as they love it, they aren’t born knowing how to run and catch and throw, or hop and skip and jump? These basic movement skills need to be taught to kids starting at a young age. When our son was two years old we decided to be intentional about helping him develop movement skills. It was important to us that our little bundle of energy never lost his desire to move. Now that he’s nearly nine years old, I can attest to the fact that what we did worked. He still loves to move (sometimes too much given how often I find myself saying, “Please sit down and eat, you are not an animal!”) and in the past six years our son has dabbled in every sport and activity. In fact, his biggest challenge is choosing! Anyone can do what we did with just a few small tweaks in your home environment. We set up our space to encourage him to play, move, and develop skills. Here are six practical and easy tips on how to keep your toddlers busy and develop physical literacy even if you’re working with a small space. When my son was a toddler, my husband hung a balloon by a string in one of our doorways at the perfect overhead striking height. We just left it there. Anytime he passed that balloon, he would approach it with eyes sparkling like he was a world class volleyball player about to spike the ball to Olympic gold. As he grew, we shortened the string. He has now transferred that skill into overhand throwing and badminton. We also leave balls everywhere and always have. What might look to some as a messy house is actually purposeful. And guess what? That means that throwing, bouncing, dribbling, and moving your body around obstacles is everyday fare. Create space. Please don’t lose me here. We live in a very long, narrow, and small home (about 1,400 square feet), so trust me when I say you can do it. It’s okay to move your furniture. Our dining room table is tucked against the wall and only pulled out when it’s time for family dinners. This creates a sort of runway for running, playing hockey (dining room chairs make a great net), or setting up a door hanging basketball net for indoor play. We also made a conscious choice to hold off on getting “nice” furniture until our son is older (still waiting on that). This won’t work for everyone, so maybe you have an active space or a room that resembles your old college dwellings. We have also always limited the number of breakable items so we’re not constantly saying “careful, don’t throw that ball or you’ll break that picture”. Instead of squashing my son’s desire to throw, I just moved the picture. 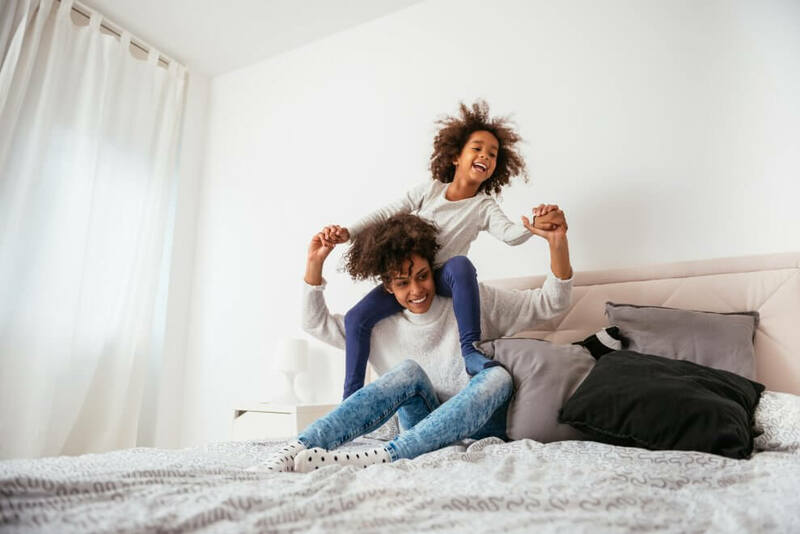 I’m not sure if you were told as a kid that you weren’t allowed to jump on the bed (didn’t that make you want to do it even more?). So we didn’t fight it. When I could sense the “ants-in-the-pants” syndrome coming on I took my son up to my bedroom, threw him on my bed and said “jump,” ready with my scorecard to hold up a perfect 10 when he dazzled me with his moves. I also know not everyone will be comfortable with this idea, so if that’s the case, consider buying a little trampoline (rebounder) or saving your old crib mattress to throw on the floor once they’ve progressed to a big kid bed. If you have a small outdoor area, an easy way to encourage movement outside is to keep a basket full of balls (replenish often as inevitably some of these will become gifts for the neighbours), a kid-sized basketball net, and a small soccer net out in the open for your child with play with. A bucket full of water balloons encourages kids to throw, run, and get a fantastic core workout from all the laughter.